Portal	Board index Live on The Xperience Get in the ring! XWA Massacre MAIN EVENT: Albion Gale vs. Joey Miles - XWA World Television Championship Match! XWA On A Pole MAIN EVENT: Danny Diamond vs. Sean Young - SUPREME XWA CHAMPIONSHIP! XWA On A Pole: Fighting Gold vs. Barnez/Acid - HEADLINER! XWA WORLD TAG TEAM CHAMPIONSHIPS! 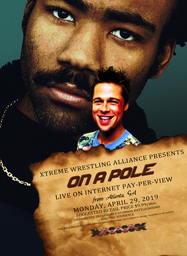 XWA On A Pole: Albion Gale vs. Jace Albright - CONTENDERS COLLIDE! XWA On A Pole: Archer/??? vs. Morales/M. Carter - OPENING MATCH! TAG TEAM CONTENDERSHIP!